I have always enjoyed music. My taste is defintely eclectic. Whether it be chill out or dance, pop or classical, I love listening to music. My choices. It is so evocative taking you back to times and places in an instant. Some make me smile but conversely there are those that bring sadness too. I feel the same about the fells. Great walks, locations, new friends, people I have met on workshops have all brought me pleasure. Of course I can never forget times when I have had no choice but to take out the camera and photograph the fantastic view before me. Creating memories that last a life time. It is what we do. I am sure it helps create 'you' as a person and brings so many things into perspective. I know that most of you who read my pages share a similar outlook to myself in that 'we' appreciate the outdoors and a by product of that is our appreciation of good photographs that capture that. I think it comes from deep within us and that feeling and love of the natural world permeates into our daily lives. I honestly believe we become more rounded as people and have the ability to 'see' more of what surrounds us from day to day. Those walks we take up onto the fells or around the shorelines allows us time to think and make decisions. With the magnificent views, the Herdwicks and the wind (I don't count the rain....) as company, we can use that time to give us the breathing space to think and pace our lives. I have often made decisions that have been positively reinforced during and after a walk. That elation you feel after achieving something you didn't think was a possibility gives you a great boost. I regularly meet people with cameras out on a walk who simply enjoy taking snaps. It has now become a part of their kit. They take photographs as memories. Nothing more. Once in a while they will take a cracker and want to replicate their new found skills. There are those who become fixated and will travel and climb to great places and heights in order to achieve 'the shot.' I am lucky in that I do this as job and regularly am asked to talk to camera clubs and societies. they deliver a great way to further your photography and they also provide competitions for their members. It helps develop them (no pun intended) and they enjoy the challenges that they bring. When out and about, I have never consciously thought about taking photos that will win competitions. Unless on a commission, I take everything for me. I have only entered a few and had a modicum of success but my advice is simple. Unless on a directive, just shoot for you. Do what is needed to help you develop and submit your best for 'the comp' if that is what is needed. Irrespective, I always tell folk 'if thats what you liked when you took it thats great.' Dont worry if someone else has taken that shot from that position before. It is yours. Me? If I am pleased then thats all the matters. If other people like it then that is a great honour but it is my pleasure that is paramount. Thats why I take photographs in the first place. They help document me, my life not just as a pro but as a person. They reflect me whether thats on the fells, abroad or shooting to order. I have always approached my work in a simplistic way. If I am moved by the view then I photograph it. If I am walking around on holiday and something pops up in front of me then I take the snap. I enjoy being faithful to the scene and regularly ask people who attend my workshops, "is what you seeing in camera what you are looking at now?" To me thats very important. There is no wrong and right. Perspectives. It is each to their own but I am a traditionalist and just love to snap what I see. What a great way to satisfy the soul and photography has given that to me. My past month has been wonderfully hectic. Apart from appreciating the proper summer we are having, I have not only been undertaking workshops with a lovely array of people but delighted to have been asked by FUJIFILM to appear as the main character in their new film project. I cannot say what that is about at present but it was fantastic being infront of the camera after so many years behind it. The iconic Lingcove Bridge. Just one of the fabulous locations used the forthcoming FUJIFILM programme. I loved Producing and Directing programmes. It is a great way to build an 'image jigsaw' then serve it up before people. the amount of work that goes into making proper films and TV is considerable and I respect the people who have now ventured off into that genre. After 200+ programmes in the bank, I am now enjoying the still image just as much but I must admit that being on the shoot rekindled my appetite for video again. As well as teaching, I am proud to have been the National Director of the Video and Photography Course for the Home Office, it was my main life. Running that concurrently alongside my landscape photography for over 35 years was fantastic. I wouldn't have changed a thing. It was a real pleasure working with professionals again in that field (literally) and seeing the enjoyment that they derived from their work. I totally 'got' what they were doing and I could relax and just be 'me' as they got on with their work. I cant wait to see the final cut and will keep you posted when the film hits the net. In other news, myself and Vicki Proctor took the decision to postpone our PHOTOWALK along the River Esk. Not only was the heat a factor (it was 31 and exposed) but the lack of water in the river would have made it a less than a productive afternoon photographically. We are grateful that all who were booked are happy to go when the date is rescheduled. The River Esk. This magnificent waterfall usually covers all those visible rocks then tumbles down and cascades towards Boot. The gentle splash of water tells its own story. I took this just last week and bear in mind that six weeks ago the water was literally spilling over the banks. Now though? It is a trickle. A few heavy downpours will help to get it back into shape. I have been compiling and writing articles in support of the TRAIL Magazine 'MOUNTAIN PHOTO COMPETITION' again. I was delighted to be asked back and they will be appearing from this month, running towards the conclusion of the competition. The standard of entries last year was very high and I look forward to seeing more again. Good luck if you enter. Last night it rained here in Cheshire. It really rained yet it has hardly permeated the ground. As for my beloved lakes,I have not seen the them look so depleted of water for a very long time. I recall '76 but in my head, this seems and appears to be just as bad. One thing that did strike me was the how 'crunchy' the ground had become and ever so brittle. The way the grass and soil had literally moved away from the rocks due to lack of moisture was alarming. There are 2-3" gaps where it has lifted and the delicate feel of the earth under your feet is alarming. 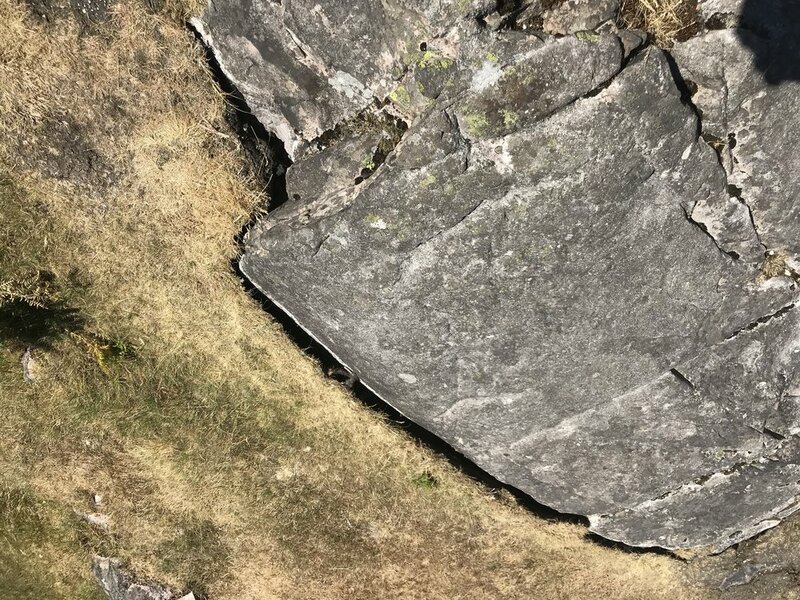 The alarming gaps that now 'draw' dark outlines around the rocks. We face a hose pipe ban in the North West and not too far away from here the ground was scorched in terrible wild fires on Saddleworth Moor and over on Winter Hill. I believe one was Arson but others have been started by carelessness. Most assume that it is a discarded cigarette or BBQs that are to blame but leaving plastic and glass bottles lying around is also a factor. None of those things happen without us. I hate to preach but that wonderful place we love to enjoy? It needs looking after. Enjoy the rest of the summer and dare I say it, lets hope for a few deluges to allow the natural world we love to breathe again.